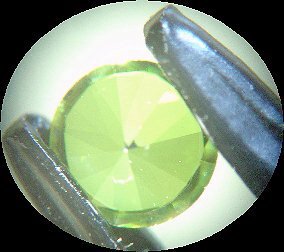 In this set of gemstone identification quizzes, I’m placing you in a familiar setting. When we’re buying gems, our excitement can sometimes get us into trouble. Experience doesn’t necessarily help, either. I hate to admit it, but I still struggle with temptation when I see a gemstone deal that seems too good to be true. Of course, as gemologists, we need to temper our enthusiasm with research skills and common sense. These two quizzes will help improve your research skills, at least. You find yourself at a pawn shop with your loupe as your only tool. You look at four stones, all priced at $25. Which stones would make a good purchase at that price? The first stone you pick up looks like an emerald. 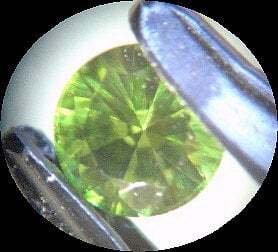 It has rich green coloring (better than these photos show) and looks to weigh close to a carat. First, you examine it face up, with overhead lighting. Next, you examine the pavilion with overhead lighting. When you hold the stone to a window for backlighting, you see this. Is this gem worth the price? 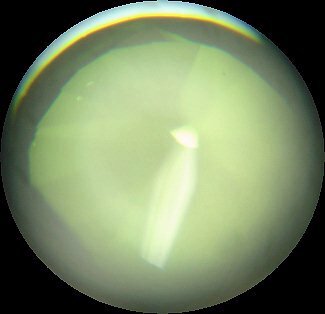 Should I Purchase This Stone?